GOOGLE EARTH IMAGE TAKEN MAR 13, 2011 SHOWING STRANGE CLOUD. GOOGLE EARTH IMAGE TAKEN JUN 28, 2010 SHOWING STRANGE CLOUD. 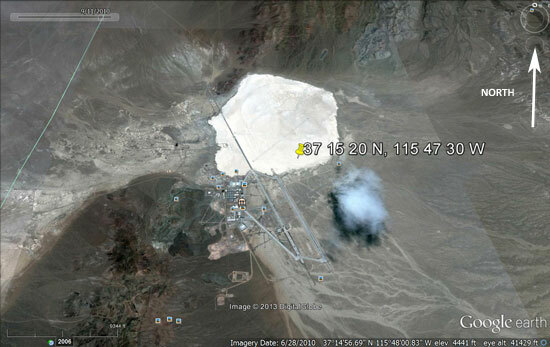 Description: I was searching the historical imagery of Area 51 to view the progress of new structures. The cloud casting a shadow from a northern sun caught my attention. That fake cloud is the “smoking gun” that proves that particular image has been modified. It’s simply impossible for shadow casting to occur from a northern sun at that location. It can’t be debated or explained as anything else other than photo tampering, as the laws of physics of the solar positions relative to time and location are a scientific fact. If you search the historical imagery you’ll find other clouds casting a shadow from a southern sun, which is correct. Although in some cases these clouds appear suspicious as they cast pure black shadows when they’re near Area 51. I have also found some unusual shape changes of Papoose mountain (part of Area 51) using the historical imagery. The mountain seems to shrink and grow, vertically and horizontally, in some places. In this case I believe the shape changes are due to either sloppy Photoshop rework or possibly just overlapping photos from different angles. It’s not conclusive. This entry was posted in 2010, 2011, Discovered anomaly in photo, news-2012-onward, Photos, Possible crash, Possible military aircraft, Possible Military Manuevers, UFO Sightings Nevada, Unidentified. Bookmark the permalink. I’m absolutely amazed at the minimal knowledge of physics and cartography demonstrated within the comments about the Google Earth Area 51 image. 1. The cloud shadow is NOT in the correct position in reference to the location and regardless of the time of year. If you examine the cloud image the shadow is casting an approximate 15° to 20° offset with respect to the cloud. Hence using simple math the shadow location could only result if the sun was at a position of 70° to 75° from relative NORTH. The fact is the true solar position for that particular Nevada location reaches a maximum angle position of 77.3° from the SOUTH on June 21st for the peak position. The problem is a northern sun position, like the one provided in the Area 51 photo, can only occur south of the equator. Lima Peru is a good reference example. It is impossible for the sun to be positioned 70° to 75° from the north at the Area 51 location. The solar position in reference to time of year and location is not a subject of debate; it is the laws of our solar system and optical physics. 2. The cloud shadow is not an optical illusion caused by camera directional rotation. The rule is the north-south reference axis is mapped in the Area 51 photo. That means the photograph when taken was orientated to match the north-south-east-west axis. This is not a subject of debate; it is the rule in cartography. 3. The cloud shadow is not an optical illusion caused by camera angular reference position. Regardless of camera angular position, given the north-south-east-west rule in cartography, a shadow cast by any particular object cannot be altered to appear out of phase or in a opposite position with respect to the actual position. An angular shadow can be shifted in amplitude but it cannot be shifted to appear out of phase. (Unless you reverse the north-south-east-west cartography reference rule) This is not a subject of debate; it is the rule of cartography and the laws of optical physics. 4. When you examine other clouds photographed spanning many years over the state of Nevada you will find that all other cloud shadows are in the correct locations showing solar positions of southern east to west positions throughout various times of the day and calendar year. If you search Google Earth images south of the equator you can observe clouds casting shadows that indicate a northern sun. 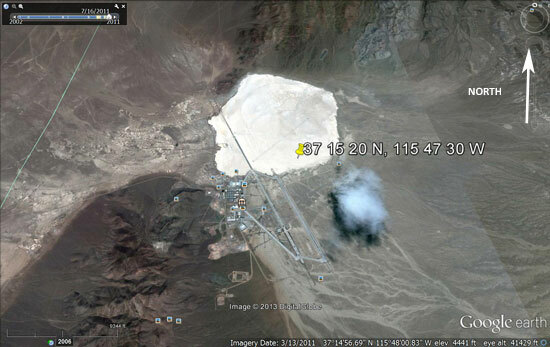 Again the emphasis is the Area 51 location is in Nevada. Nevada is not located south of the equator. The sun does not randomly travel north nor does the sun set in the east if you’re observing it from the east coast. The earth is not flat and yes mankind did in fact land and walk on the lunar surface. I have seen the pictures and discussion about the Area 51 “cloud”. As for what the “cloud” is, it’s not fake. It’s either a rogue cloud or perhaps it’s a smoke cloud from a brush fire. What caused it, I don’t know, but’s it’s most likely real. The bigger problem, which is easily solved, is why it shows up on 2 different pictures nearly a year apart. Goggle gets it’s images that it uses for Google earth from a variety of sources. Not all of the earth is photographed all on the same day, and not even all of an area is photographed all on the same day. The 2 pictures that are in question are composites of probably a few different pictures, at the very least they are composites of at least 2 pictures. The dates for the pictures are only correct for the portion of the picture that is centered, the base itself. Some of the surrounding area, like where the “cloud” is, was taken at a different time. You can easily check this by zooming in on the cloud, and then engaging the time line. You will not find a photo of the cloud for March 13 2011. The correct date for the “cloud” is June 28 2010. Obviously on March 13 2011, the part with the cloud was not photographed and was stitched together with the last photos taken of the missing areas. For the cloud area, that was June 28 2010. This also accounts for the slight color variations in the 2 photos on your site. Some of those other areas that were used to make a complete picture had slightly different lighting conditions. Hopefully this helps the discussion on your site come to a peaceful end. Google Earth pictures of very large or extended features on the ground are not one single image, but many images of different sizes and shapes stitched together. Yes, these two pictures are exactly identical, including the cloud, except for the shadows of the mountains in the lower right of the pictures which are very different. The image with the long dark shadows on the north side of the mountains was likely the one taken in March and the image with missing shadows among the mountains was likely taken in June when the Sun is nearly overhead or closer to the zenith. I would disagree with the analysis of the cloud shadow. Likely, a photo from March, when the Sun was near the Spring Equinox was simply & accidently used twice. The photo, if north is correctly plotted, was taken from south of the cloud, so you should see the shadow on the ground & underneath the cloud at that angle, which you do. I wonder why the same cloud shows up on two images taken a year apart. I verified this using Google Earth Pro which subscribe to. It is clearly not a real cloud and was inserted in the photo. The weather observations in my report nearly totally contradict that this nature of cloud was present. And that’s the 64,000 dollar question. If not a mistake, it’s totally impossible for the same cloud to show up a year later! Having been a frequent traveler to Ttikaboo (8 trips last count) I can say from experience that there is nothing so strange about this cloud formation. Out there, clouds can appear and dissipate in a matter of minutes. The weather is the only thing strange out there. It could be freezing in the shade and burning hot when under sun. Although I can account for some strange going ons around the area, as far as the weather and environment there is one interesting phenomenon: The luminescent glow on a dark night of the surrounding mountains is most interesting. This is a fabricated cloud. The shadow indicates that the sun is in the north. Why would the same “exact” cloud appear in two images taken nearly a year apart? I don’t usually go in for conspiracy stuff. I mean, I love reading it. I never really buy it. IF the dates on those two photos are real, and the author didn’t manipulate the photos, then that cloud IS pretty shocking. Not that we can ever expect anyone to account for it. I mean, they’ll never tell us what’s up. If the satellite which took the photo is south of the base, then the shadow of the cloud is going to appear as it does in the photo. Your the idiot. The same cloud appears in 2 photos taken nearly a year apart. The IKONOS satellite shoots a wide swath ahead of it and is a polar orbiter. This is also assuming that the government didn’t simply provide the same image at two different times for “security” reasons.